I collaborated with a small team of designers and editors to launch the Washington Post's Snapchat Discover channel in February 2017. We were one of the first hard news sources on the platform. All "top snaps" are produced, designed, and animated on a daily deadline and turnaround. We released editions daily but also updated existing editions with breaking news. A couple of full examples of a 10-second top snaps with audio. 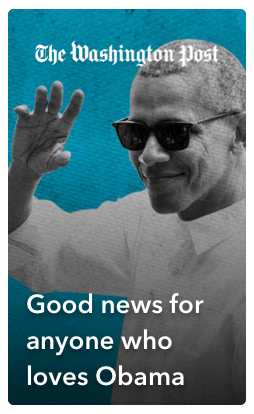 A series of snaps dedicated to Obama's post-presidency. A breaking news series about Trump's climate change decisions and how it'll affect you. A photo illustration created for a snap about Spicer's most memorable moments.